Create a dedicated service to access the database. In this lesson, you create an EGL Service type, which is a main type. You must place each main type in a separate source file, and the name of the type must be the same as the name of the file. In the Project Explorer window, right-click PaymentService, and then click New > Service. 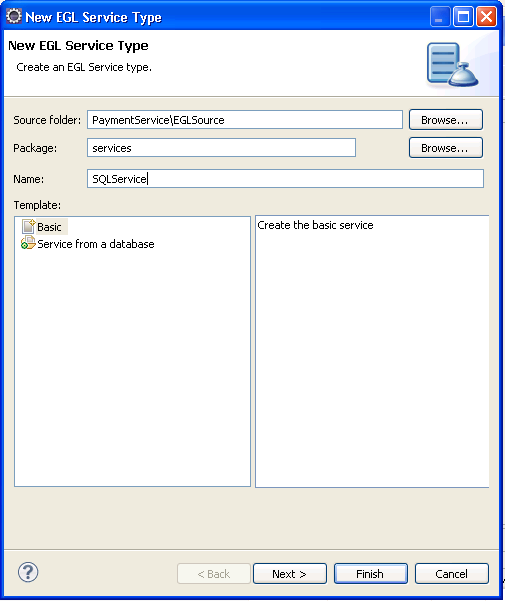 In the EGL source file name field, enter name SQLService. EGL adds the .egl file extension automatically. In the Package field, enter the name services. Click Next. Verify that Create as web (EGL REST-RPC) service is unchecked, and leave the Interfaces to implement field empty. Click Finish. EGL opens the new Service type in the editor. Remove the code from the file, leaving only the following lines, and save the file, but do not close it. You learned how to create an EGL Service type. In the next lesson, you add code for the functions to SQLService. This page was last modified 02:32, 27 December 2012 by mingxia shi. Based on work by Ben Margolis and Paul Hoffman.